April is a month that includes taxes, fools, the occasional snowstorm, and this year the New York Primary. We’ll leave the primary alone. As T.S. Eliot said, April is the cruelest month of all, so we don’t need that added difficulty. It’s also the month that includes Earth Day, and for many, a time to contemplate our relationship to the planet and its nonhuman creatures. Since I’m half Lithuanian, some of those creatures include trees. And so I decided to try a tradition from that country, and tap a birch tree for its sap. Yes. I said birch, not maple. It’s something done a lot in the Baltic regions and Russia, and even Alaska. 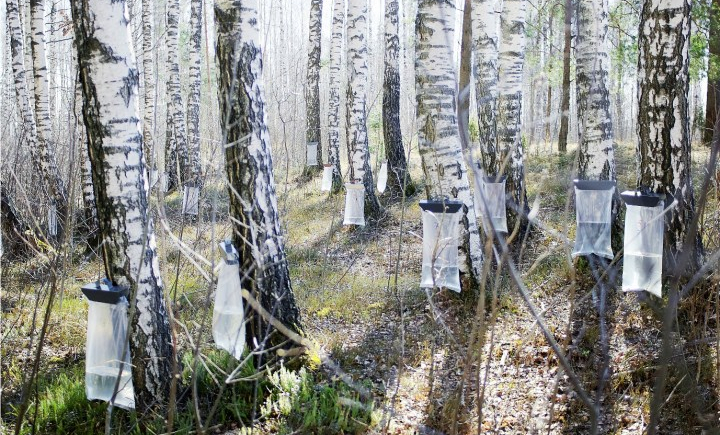 The sap or water of the birch has a lower sugar content than Maple, so it’s not as commonly used to make syrup. But it has lots of minerals that are good for you, and from what I’ve read makes a fine wine as well as syrup. However, I didn’t really want any of that. I just wanted to taste a birch tree. Every day I walk my dogs in the woods behind my house, where we pass groves of birches, groves of pine trees, groves of fir trees and even some venerable old oaks. I understand that trees are life giving and life sustaining, and for that they have my admiration and my gratitude. Then again, I’m of Lithuanian heritage, and so I come by it honestly. For Lithuanians, forests were and are sacred places, with some venerable groves being even more sacred than others. I track some of that ancestral spiritual history, that complex relationship with trees and bees, in my novel, The Amber, which also tells the difficulty of a Lithuanian-American woman trying to figure out an affair with a man who sold his soul to the devil. “The Bishop served the god of princes, of the wealthy and the learned. Yet, what he wanted was wrong. That’s just how it is. And so, as a way of honoring my relationship with the trees, I wanted to get a little closer, and taste them. I put the tap in with care, and will close it when I’m done. I won’t tap that particular tree again. When I found my jug full of birch water, I thanked it. I took the water home, and though I know you’re supposed to boil it briefly to avoid bacteria, I took a chance on a few sips fresh from the source. Though it’s mostly water, it’s also mildly sweet, complex with something you won’t taste in plain water. I asked myself what it tasted like. I answered myself: It tastes like light. Now, you may see this as quirky imaginings of a fiction writer, but I’m not making that up. What I thought of was drinking light. That thought created a more complex relationship between me and the trees I walk under every day. Though intellectually I’m always aware of what they do to keep me alive, tasting birch water made the connection physical and immediate. Before, I knew. Now, I taste and understand. We share breath. We share water. We share light. This April, after your taxes are done and the circus has left town, take some time to connect your knowledge with your understanding. Talk with a tree, and listen to it. Plant a tomato, and taste the earth it grows in. Admire a dandelion or a daffodil. Watch a bird wing across the sky. And know that with all this and more, you share breath. You share water. You share light. wow — beautiful thoughts given such eloquence with the pen. my soul thirsts for words like these!